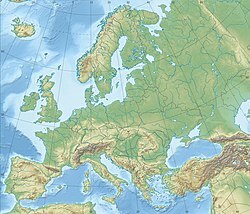 Newbridge, officially known by its Irish name Droichead Nua ([ˈd̪ˠɾˠɛçəd̪ˠ n̪ˠuə]), is a town in County Kildare, Ireland. While the nearby Great Connell Priory was founded in the 13th century, the town itself formed from the 18th century onwards, and grew rapidly alongside a military barracks which opened in the early 19th century. Taking on the name Newbridge (An Droichead Nua) in the 20th century, the town expanded to support the local catchment, and also as a commuter town for Dublin. Doubling in population during the 20 years between 1991 and 2011, its population of 22,742 in 2016 makes it the largest town in Kildare and the fifteenth-largest in Ireland. The Irish language name of the town is the official name, "An Droichead Nua", meaning simply "The New Bridge" and was introduced in the 1930s. Noble and Keenan's map of Kildare 1752, drawn before the town was started, marks 'The New Bridge' in the vicinity of 'Old Connel'. A number of other places marked on this map, including Ballymany and Morristown Biller, are represented in the names of modern housing estates and streets. Settlement in the area dates from the 13th century (with the foundation of Great Connell Abbey) and the current town is made up of six ancient civil parishes along with portions of others. The parishes are Ballymany, Great Connell, Killashee, Morristown Biller, Old Connell, and Carnalway. Great Connell Priory was an important Priory, founded in 1202 by the Augustinian Canons. The earliest known mention of Newbridge was by traveller and bookseller John Dunton in 1698, though he does not refer to any settlement other than at Ballymany. A mass house (Roman Catholic Chapel) was built beside the bridge about 1730 and an inn, called New Bridge Inn, was in existence in 1750. The first bridge was destroyed by floods in 1789 and William Chapman, engineer on the Grand Canal extension to Naas, was employed to rebuild it the following year. He moved the site from the 'Watering Gates' to its present location and redirected the high road from Buckley's Cross (roundabout at Pfizer) to the new bridge, and continuing as what is today Main Street and Edward Street to the turnpike at Gandogue Lane (behind the modern Credit Union building). The old high road continued in use to serve the village and mass house, which was taken down in 1852 upon the opening of the new church (St Conleth's). The origin of the modern town lies in the establishment of Cavalry Barracks (1815–1819) on land purchased from three local landlords: Eyre Powell of Great Connell, Ponsonby Moore of Moorefield and William Hannon of Kilbelin. This barracks originally extended from the River Liffey to Cutlery Road, and from Main Street to Military Road, however little of the barracks remains today except the old walls and gateways which can be found on the Athgarvan Road, and to a lesser degree on Cutlery Road. The "Watering Gates" located at the entrance to the Town Park was also constructed as part of the original Barrack building (and as the name suggests this "gate" was used to facilitate access to the river for the horses from the barracks). At the same time, Eyre Powell gave land north of the new high road for building houses and shops to serve the new Barracks. Main Street took shape at the same time as the Barracks were being built. From 1819 various Cavalry Regiments were stationed at Newbridge and brought much business to the town. Newbridge expanded rapidly after the Curragh Camp was established in 1855. Eyre Street (named after the local landlord Eyre Powell) and Edward Street (named after Prince Edward, later King Edward VII, who was stationed on the Curragh at the time) were built between 1855 and 1870. The new railway opened in 1846 and churches were built at Rosberry Common (1819 – St. Eustace', Dominican), at Moorefield (1828 – St Patrick's, Church of Ireland) and at Chapel Lane (1852 – St Conleth's, Roman Catholic) to cater for the increasing population. A National School was opened on the Railway Road in 1842 (now the Parish Office) and a boarding school at the Dominican Friary in 1852. The town continued to prosper until the withdrawal of the cavalry in May 1922 on the establishment of the Free State. It went into a period of decline thereafter, but since the 1960s has seen considerable growth and has become a shopping catchment and commuter town. The town is located on the banks of the River Liffey. Upriver are towns such as Athgarvan, Kilcullen and Blessington, while downriver are the towns of Caragh, Clane and Celbridge. Newbridge is bounded by the Curragh Plains to the west, Pollardstown Fen and the Bog of Allen and Moulds Bog to the north west. Around the Curragh, and to the east are a number of stud farms. To the south the motorway now forms a boundary to the town. The area's industrial history includes rope making (at Irish Ropes PLC, established 1933, now closed) and carpet manufacturing (Curragh Tintawn Carpets Limited, established 1937, closed 2012). Cutlery and silverware is crafted at the Newbridge Silverware plant. Pharmaceutical companies such as Oral-B and Pfizer have also based themselves in the town, and the latter is located at Little Connell. Irish chocolatier Lily O'Briens is based in the IDA Business Park on Green Road, Bord na Móna has its headquarters in the centre of Newbridge, and the Department of Defence has a base on Station Road. The Kildare/Leixlip Branch of general workers union SIPTU has its headquarters at Georges Street. Many people living in Newbridge commute to work in Dublin. The town is situated on the main Dublin-Cork railway line which connects the town to Dublin, Cork, Limerick, Galway, Waterford and Westport. A regular commuter train service operates between Newbridge and Dublin. Newbridge railway station opened on 4 August 1846 and was closed for goods traffic on 6 September 1976. The M7 motorway bypasses the town; the R445 connects the town to the bypass (Junctions 10 and 12 on the M7) along the route previously forming part of the N7. The M9 to Kilcullen, Carlow, Kilkenny and Waterford leaves the M7 west of Naas at Junction 11. A private bus service known as Dublin Coach also operates a service through the town linking the town to the Luas and Dublin Airport. Retailers such as Debenhams, Marks and Spencer, and Zara are anchor tenants of the town's shopping centre. The Whitewater Shopping Centre also has a 6 screen cinema, operated by UCI, which opened in December 2009. Shops such as Penneys and TK Maxx have also opened in Newbridge within walking distance of the Whitewater Shopping Centre. There are a number of churches in Newbridge representing several denominations. In the Roman Catholic divisions, Newbridge is situated in St. Conleth's Parish in the Diocese of Kildare and Leighlin, and the parish has a total of three churches in the town: St Conleth's Parish Church (1852), Cill Mhuire (1983) and the Dominican St. Eustace's Church (1966). A Church of Ireland church (1828) is located in the Moorefield area of town, and is part of St. Patrick's Anglican Parish. Newbridge Sports Centre hosts the African faith group "The Kingdom of Heavenly Water, Fire and Mountains" and a Jehovah's Witness Kingdom Hall is located just outside the town, near Milltown. Open Arms Church is located within Newbridge Industrial Estate. Newbridge Bible Fellowship Church is located in the Roseberry section of the town. Primary schools serving the town include Scoil Mhuire, Gaelscoil Chill Dara (an Irish-medium school), The Patrician Primary School, St Conleth's Infant Primary School, St Conleth's & St Mary's Primary School, St Patrick's National School, Newbridge Educate Together National School, and Scoil Bride in Athgarvan. The large growth in the town's population has led to a shortage of places at primary school level. Secondary schools in the area are the Patrician Secondary School, the Holy Family Secondary School, St. Conleth's Vocational School, St. Marks School, Newbridge College, a fee-paying co-educational secondary school, run by the Dominican Order, Leinster Senior College, a small private fee-paying school and, near the town, Gaelcholáiste Chill Dara, is Kildare's only Irish-speaking second-level school. St Conleth's is also home to a branch of the National College of Ireland, which offers a small number of "level-five" courses to Leaving Certificate students. Sundai Ireland International School, a Japanese international school, was previously based in Newbridge. The Kildare VTOS adult education centre is located in the town, and offers programmes to mature students. Newbridge is home to Kildare Gaelic Athletic Association's county grounds, and the sport's two local club teams, Sarsfield's GAA and Moorefield GAA. Active association football clubs include Newbridge Town F.C and Newbridge Colts Football Club, both members of the Kildare and District Football League. Kildare County FC previously fielded teams in the League of Ireland First Division. Newbridge RFC is the town's only Rugby Club. Founded in 1996, with the amalgamation of the Curragh RFC and Kilcullen RFC, Newbridge RFC compete in the J1 Division 1 Leinster League. The Kildare History & Family Research Centre is based at the library in Newbridge and houses a local history collection and genealogical research service. Newbridge Tidy Towns Association's main aim is to improve the living environment in the town via participation in the national Tidy Towns competition. Since the launching of National Tidy Towns Competitions in 1958, Newbridge has received: the Silver Medal in 2013 & 2014, Bronze Medals 2008 to 2012 inclusive, and a Race against Waste 2005 Certificate of Excellence / Highly Commended award. Newbridge has a public library and an arts centre, the Riverbank Arts Centre. The Liffey Linear Park is an outdoor amenity alongside the River Liffey. This park, comprising seven acres, stretches from the bridge to the Athgarvan Road (Gables Leisure centre). There is also a sports centre (with both indoor and outdoor facilities), three gyms, two swimming pools, a children's playground, and a number of sports and leisure clubs. There are several golf courses in the area, with water sports, fishing and the Curragh Racecourse all also close by. Newbridge also hosts Kildare's only greyhound racing track. Nearby (and within walking distance of the town) are the Curragh Plains, Moulds Bog (Roseberry), and Pollardstown Fen. The Gables Guest House & Leisure Centre is located on Kilcullen Road and has a 20m swimming pool and gym. Newbridge is twinned with the town of Bad Lippspringe in Germany and the city of Ocala, Florida, United States (2008). ^ a b c "Sapmap Area - Settlements - Newbridge". Census 2016. CSO. 2016. Retrieved 12 January 2018. ^ "A Brief History of Co. Kildare". kildare.ie. Kildare Community Network. Retrieved 2 July 2018. ^ a b c d e "History of Newbridge". kildarelocalhistory.ie. Kildare Federation of Local History Groups. Retrieved 2 July 2018. ^ a b "£55m mixed Newbridge scheme may keep shoppers in Co Kildare". irishtimes.com. Irish Times. 12 July 2000. Retrieved 2 July 2018. ^ a b c "The lives of Irish commuters: 'I'm in the car up to 5 hours a day, but I have no other choice'". irishtimes.com. Irish Times. 26 August 2017. Retrieved 2 July 2018. ^ "Co Kildare, where the living is easy - and it's a quick commute to the capital". irishtimes.com. Irish Times. 12 May 2011. Retrieved 2 July 2018. ^ Newbridge Local Area Plan 2013–2019 (PDF). kildare.ie (Report). Kildare County Council. December 2013. p. 13. Retrieved 2 July 2018. ^ a b c d e "Droichead Nua or Newbridge - A Brief History". Newbridge Tidy Towns Association. Retrieved 2 July 2018. 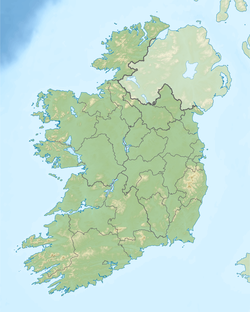 ^ "Toponymy resources - Map of county Kildare, North". Logainm.ie. Irish Placenames Commission. Retrieved 2 July 2018. ^ "Server Error 404 - CSO - Central Statistics Office". ^ "NISRA - Northern Ireland Statistics and Research Agency (c) 2015". Archived from the original on 17 February 2012. ^ "History of Newbridge - Industry - Curragh Tintawn Carpets from Sisal to Wool / Weaving to Tufting". kildarelocalhistory.ie. Kildare Federation of Local History Groups. Retrieved 2 July 2018. ^ "Newbridge station" (PDF). Railscot – Irish Railways. Retrieved 5 September 2007. ^ "Whitewater Shopping Centre has been sold for €180m". independent.ie. Independent News & Media. 16 March 2016. Retrieved 3 July 2018. ^ "Newbridge Parish". newbridgeparish.ie. St. Conleth’s Parish, Newbridge. Retrieved 2 December 2018. ^ "History of Newbridge". kildarelocalhistory.ie. Co. Kildare Federation of Local History Groups. Retrieved 2 December 2018. ^ "Welcome Open Arms Church". openarms.ie. Retrieved 2 December 2018. ^ "Contact address". newbridgebiblechurch.org. Newbridge Bible Fellowship Church. Retrieved 2 December 2018. ^ "GaelScoil Chill Dara (Irish Speaking School)". ^ "Holy Family School - Home". holyfamily.ie. Holy Family School. Retrieved 2 July 2018. ^ "Kildare Vocational Training Opportunities Scheme (VTOS)". kildarewicklow.etb.ie. Kildare and Wicklow Education and Training Board. Retrieved 2 December 2018. ^ "KFDL Clubs". kdfl.ie. Kildare and District Football League. Retrieved 2 December 2018. ^ "Kildare's genealogy services". kildare.ie. Retrieved 2 July 2018. ^ a b "Newbridge Tidy Towns Association". newbridgetidytowns.com. ^ "Liffey Linear Park". newbridgetidytowns.com. Newbridge Tidy Towns Association. Archived from the original on 22 March 2016. ^ "The Gables Guesthouse and Leisure Centre". ^ "Friends Across the Ocean". City of Ocala. Archived from the original on 11 March 2012. Retrieved 18 April 2011. ^ "Newbridge folk-singer Luka Bloom lends his support to the fight against homelessness with fantastic new song". kildarenow.com. Kildare Now. 2 April 2018. Retrieved 2 December 2018. ^ "Newbridge woman Clare Daly leaves Socialist Party". leinsterleader.ie. Leinster Leader. 5 September 2012. Retrieved 2 December 2018. ^ "Pat Eddery: A special talent who was born to ride". irishexaminer.com. Irish Examiner. 11 November 2015. Retrieved 2 December 2018. ^ "The Kildare woman who blazed a global trail for female scientists". irishtimes.com. Irish Times. 13 February 2018. Retrieved 2 December 2018. ^ "Newbridge's Christy Moore is being thanked by Concern Worldwide". kildarenow.com. Kildare Now. 2 April 2018. Retrieved 2 December 2018. ^ "Sinead b*witching young stars with showbiz bug". independent.ie. Independent News & Media. 24 March 2010. Retrieved 2 December 2018. ^ "Kildare comedian to talk to RTE's Claire Byrne about donating a kidney to his brother". leinsterleader.ie. Leinster Leader. 13 February 2017. Retrieved 2 December 2018. Wikimedia Commons has media related to Newbridge, County Kildare.